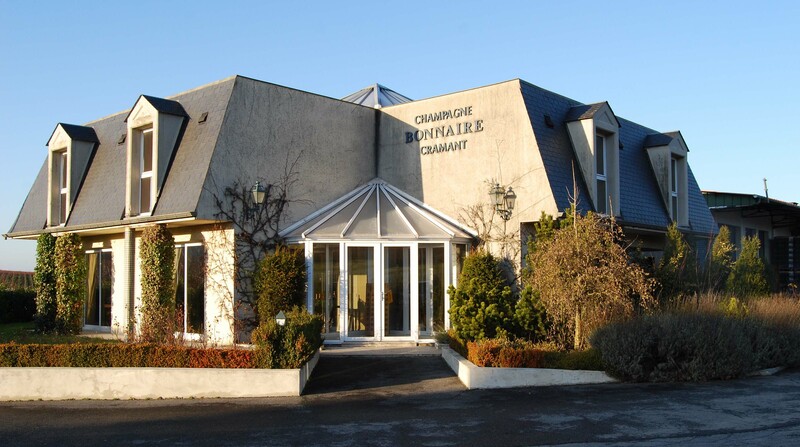 Founded in 1932, Champagne Bonnaire is located in Cramant and is synonymous with Chardonnay. Cramant is a famous (maybe the most famous) Grand Cru village in the Cote des Blancs. Following the economic crisis in 1930, Bonnaire founder, Fernand Bouquemont, decided to stop delivering his grapes to négociants and began vinifying himself. following the World War II, Fernand Bouquemont was joined by his brother in law André Bonnaire. Descended from a multi-generational family of Champagne growers, André Bonnaire focused on the viticulture side of the property with the help of his son Jean-Louis. Jean-Louis modernized production which brought better and better wines. The estate is now in the hands of his two sons; Jean-Etienne who is in charge of production and Jean-Emmanuel who looks after sales and marketing. Their mother (Madame Bonnaire) is the sister of Madame Clouet of Andre Clouet. Today Bonnaire domaine property covers and impressive 22 hectares (55 acres) of mainly Grand Cru vineyards planted mostly to Chardonnay. A blend of 40% Chardonnay, 30% Pinot Noir and 30% Pinot Meunier (from Cramant (Grand Cru), Cuis, Bergères-Les-Vertus (Premier Cru), Fossoy) fermented in temperature controlled stainless steel tanks. 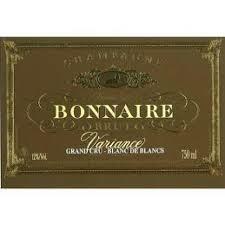 Bonnaire blends several vintages and adds 25% reserve wine. After a minimum of 36 months on the yeasts, the wine is disgorged and a dosage of grams-per-liter is added. This is clearly Chardonnay-influenced Brut NV with more citrus than red fruit with chalky-mineral earth and a clean sort of yeastiness. Leans toward the middle of the stylisitic spectrum. A delicious drink. BearScore: 91+. 100% Chardonnay all from Grand Cru vineyards in Cramant. Fermented done in temperature controlled stainless steel tanks. Several vintages are blended with 25% reserve wines. Aged for a minimum of 42 months and dosed to 7 grams per liter of sugar. Real-deal Blanc de Blancs 100% Chardonnay Champagne offering richer riper lemony citrus with a bit of spice layered overchalky minerality and developed yeast flavors. It’s richness somes from the reserve wines and the extended yeast aging. BearScore: 92. A Blend of 60% Chardonnay and 40% Pinot Noir (Cramant (Grand Cru) and Fossoy) fermented in temperature controlled stainless steel tanks. The Pinot Noir component includes 12% Coteaux Champenois red wine). The cuvee is made up from several vintages with 15% of reserve base wine. Aged on the yeasts for a minimum of 36 months and dosed to 9 grams-per-liter. An unusual Rosé in that it tastes more of Chardonnay and citrus than of the red fruits you expect to dominate in Rosé. The red fruit notes are present more as essence of red fruit. The chalky minerality of Cramant is there and the yeast notes as well for a lighter more aperitif style of Rosé. BearSrore: 91+. A 100% Chardonnay Champagne with 70% of the grapes coming from Cramant (Grand Cru) and 30% from Bergères-Les-Vertus (Premier Cru), fermented and aged in oak barrels with full malo-lactic fermentation prior to methode champenoise. 68 months on the lees before disgorgement. Finished with a dosage to bring it to a dry brut level of 6 grams of sugar per liter. Seems almost a combination of fine bubbly and fine White Burgundy. The fruit is more in the lemony citrus range (typical of Blanc de blancs) but the mineral and oak are there as well. The mineral is Champagne’s chalk (The Cote de Blanc is the heart of Champagne’s chalk) rather than the Cote d’Or’s limestone. The oak is not new but the character of the barrels is there as a complement. The whole is a delicious, fresh but satisfying Champagne with a unique appeal. Delicious. BearScore: 94+. Due to its depth and richness, this is a blanc de blancs that transends aperitif status and can be used with food at the dinner table. Recommended serving temperature is 50-53°F.